Please note that there are planned path closures from March to June 2019, which may impact on your chosen route. Click here for further information. The trail is open all day every day of the week. It’s open to members of the public and University students and staff. Full details can be found below. If you have any further question about the Art and Nature Trail, get in touch. We’d love to see your adventures across campus – so don’t forget to tag your Instagram photos and tweets with #followthathare and mention @warwickartscentre. It’s free to take part. You can collect a free map from Box Office or download a copy here. When is the Art and Nature Trail open? It’s open all year. There’s no need to book. How long will it take to complete the trail? It can take between 2 and 4 hours to walk the entire trail, depending on your walking speed and how often you stop! You don’t have to complete all of the trail in one go, you could choose the sculptures you want to see and create your own shorter route. You could also bring your bicycle and cycle around campus! I’m not a student, am I allowed to walk around campus? How accessible is the trail? Some of the sculptures on the trail are located in areas which may not be accessible by wheelchairs. Please contact creativelearning@warwick.ac.uk* to discuss your access needs and we can work with you to ensure you have a positive and enjoyable experience. 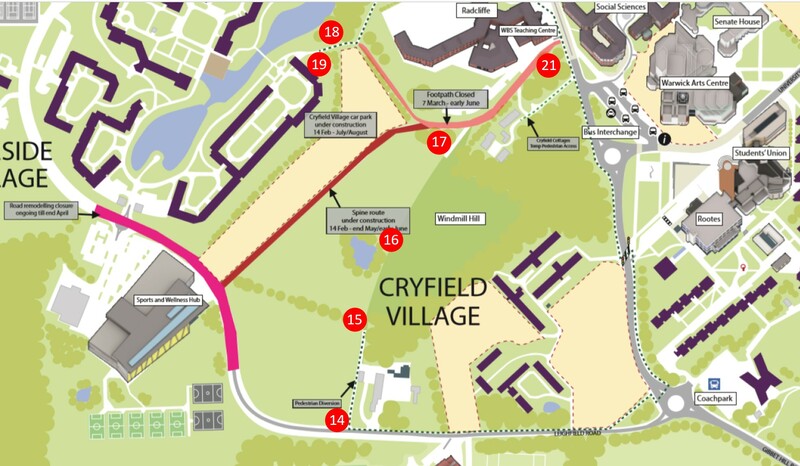 Please note the following planned path closures on campus from March to June 2019. 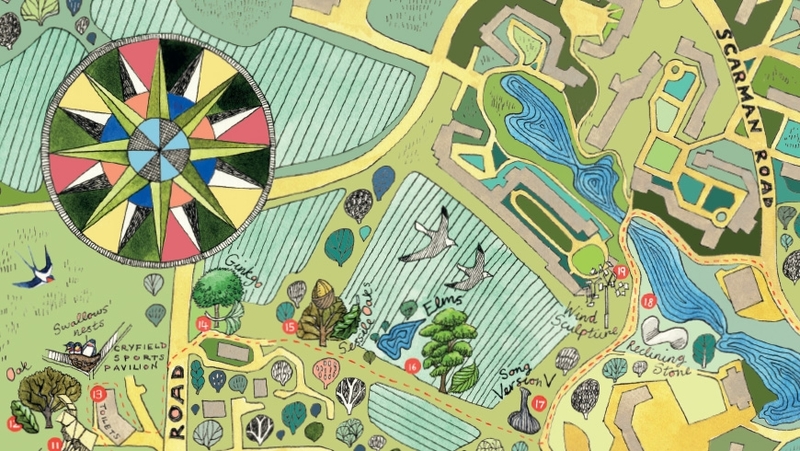 Join our Creative Learning Team on a FREE guided Art and Nature trail around Warwick Campus. You will discover some of the newest sculptures in our collection, find out about the wildlife on campus and have a chance to sketch and make as you walk around. The trail will happen whatever the weather, and some of the paths can get muddy, so remember your welllies and coats! Toilets and café facilities will be pointed out around the trail. Stick around after the trail for FREE creative afternoon drop-in practical sessions from 2-4pm. Find out what’s on here. Prefer to find your own way around the trail? Simply pick up a FREE map from our Box Office or download one here. You can also hire an Explorer Backpack every Saturday and during the school holidays. Full details below. Every Saturday between 10am – 4pm, and in the school holidays, families with children are invited to pick up a specially-designed Explorer backpack and Follow that Hare on a self-led art and nature trail around campus. The backpacks contain arts materials, binoculars and a flora and fauna check-list, encouraging all explorers to get involved. You can pick up a backpack from the Creative Learning Space, located in the Arts Centre, and then embark on your trail anytime throughout the day. As it’s self-led, you can be flexible and make the trail your own by visiting as many pieces as you can in an hour or spend a luxury 2 – 4 hours exploring campus, the choice is yours! To collect your £20 refundable deposit, return your Activity Backpack to the Creative Learning Space, where our Visitor Assistant will stamp your ticket. Please note that the ticket price does not include a personal trail guide – the trails are designed to be self-guided using the backpack and trail map. You can also take a book from our Creative Learning space to read on the way! Want to visit as a school group? We can provide bespoke tours, taking in to consideration your various needs and what you hope to achieve from the session. Email creativelearning@warwick.ac.uk to find out more. Our Visitor Assistants will take your school group on a half day trail exploring sculpture on campus with a focus on materials and technique in making sculpture. Followed by an afternoon practical session based on what we have discovered during the morning. The Art and Nature Trail is the perfect way to explore campus, get some fresh air and clock-up the daily step-count. Walk part of the route at lunchtime or beat the traffic and arrive early or stay a little later. Plan several shorter routes and spread the tour out over a week. Looking for an alternative social event for your society or department? We can design bespoke Curator-led tours throughout the year. Email creativelearning@warwick.ac.uk to find out more.